Get dressed up for Easter or any other occasion with these adorable outfits for toddlers, 12 months to 5T. Both are made from one Moda Jelly Roll. 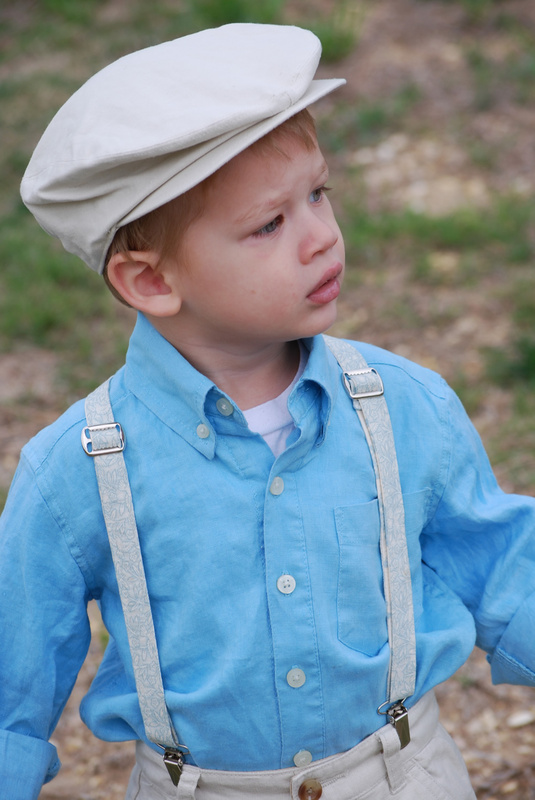 The boy outfit features a pair of timeless suspenders made from Jelly Roll strips which are fully adjustable. The girl outfit features pattern designer, Bananafana Designs, with her adorable new pattern “Lollipop”. **Please note these materials listed are to make the dress like it is shown here. The pattern may call for different yardages to make it the way it is on the pattern. fabric for appliques, yoyo’s, etc. 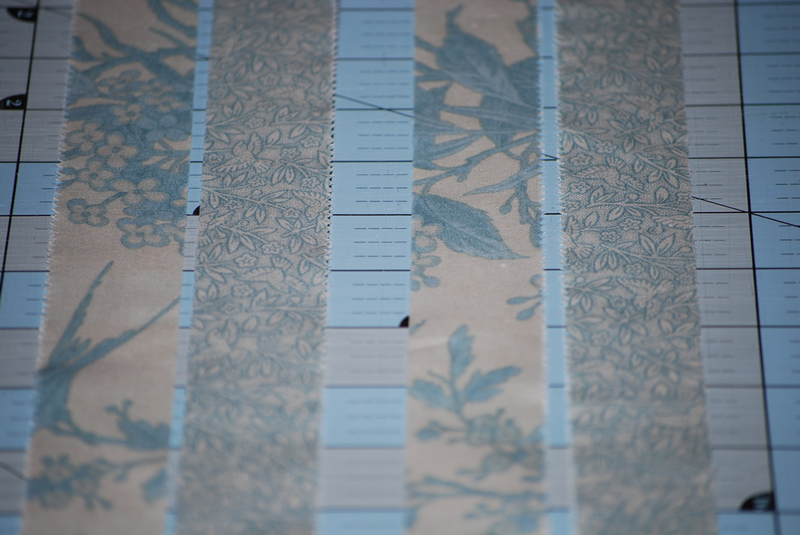 – layer cakes work great for this as you get a great sampling of all the fabrics in the collection. 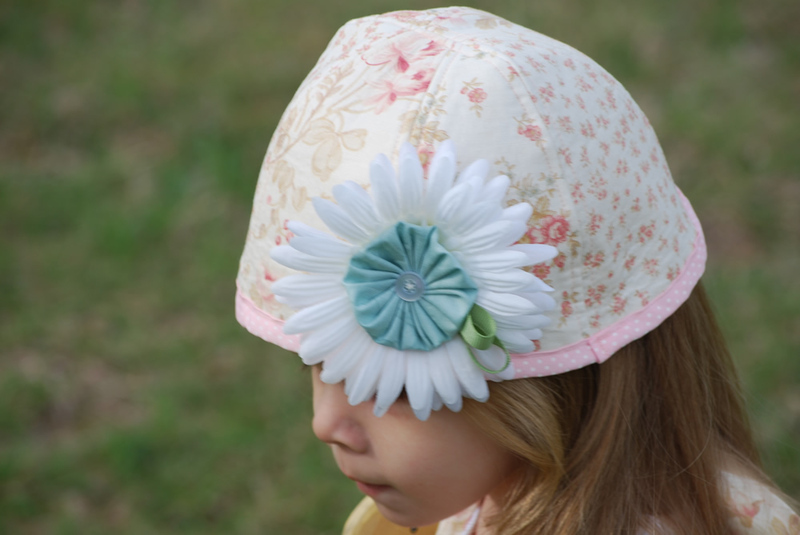 Supplies to make the hat and short bloomers included in the Lollipop pattern. 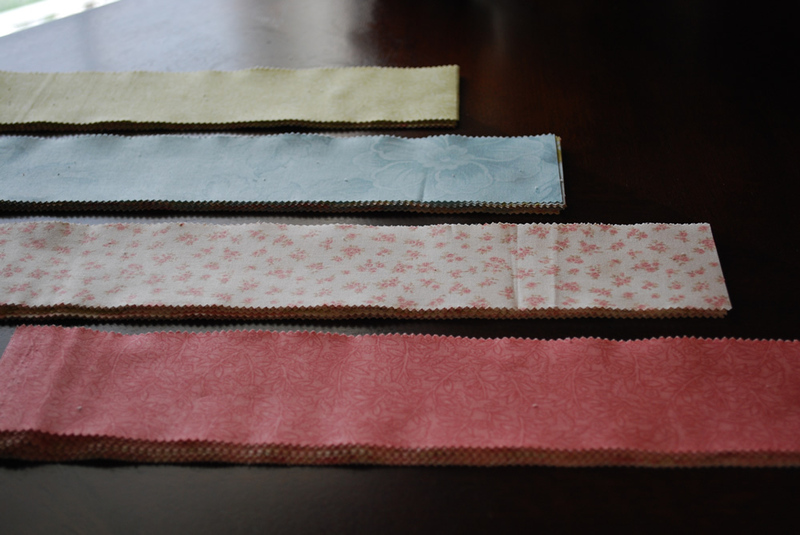 Choose two strips from your Jelly Roll to use for the front and back of the suspenders. 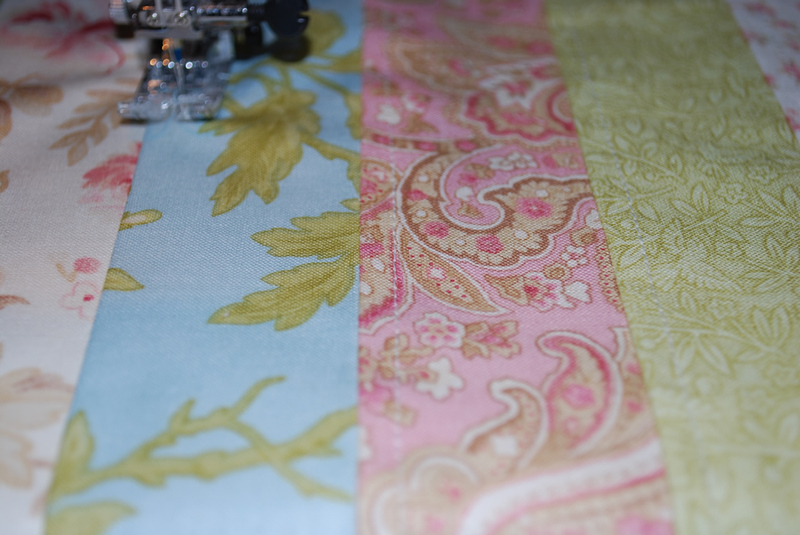 Cut the two Jelly Roll strips so they are both 29″ in length. 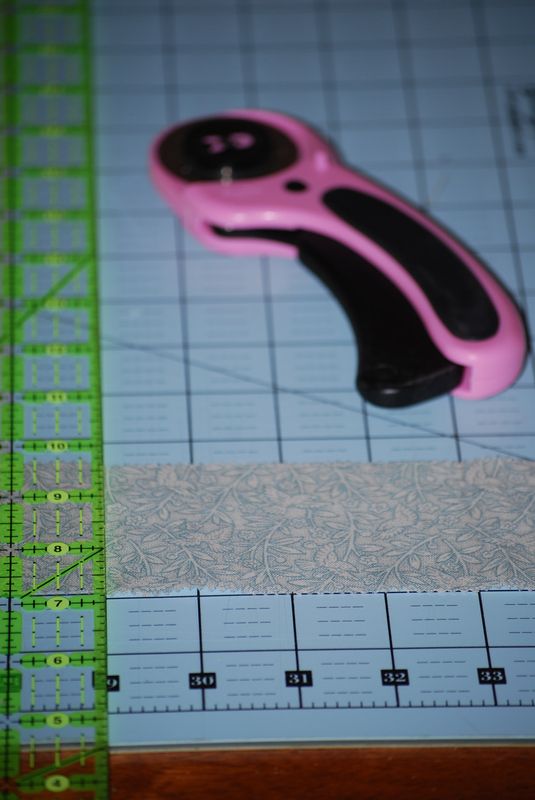 Cut the strips in half length-wise so that they are now 1 1/4″ wide. 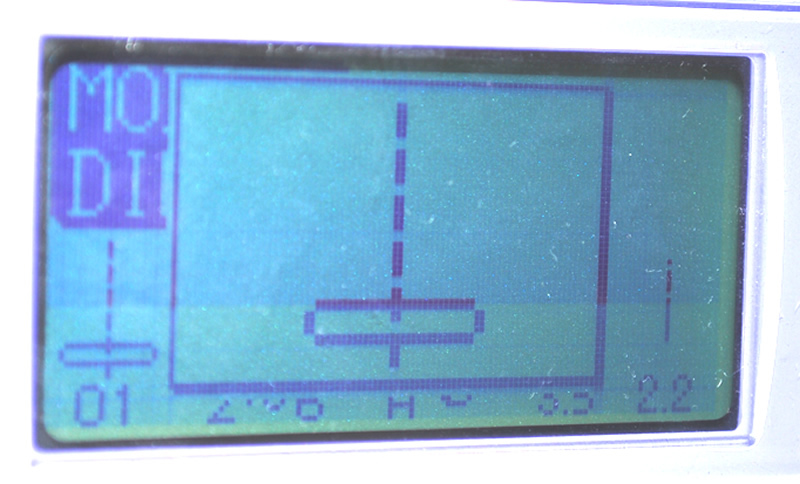 You should now have 4 strips that measure 1 1/4″ x 29″. 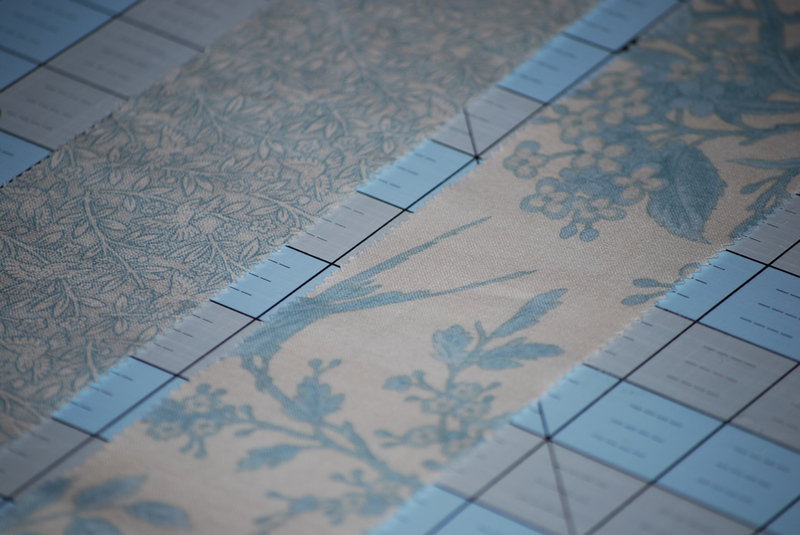 Determine which fabric you want for the visible side and which one you want for the back side of the suspender strap. 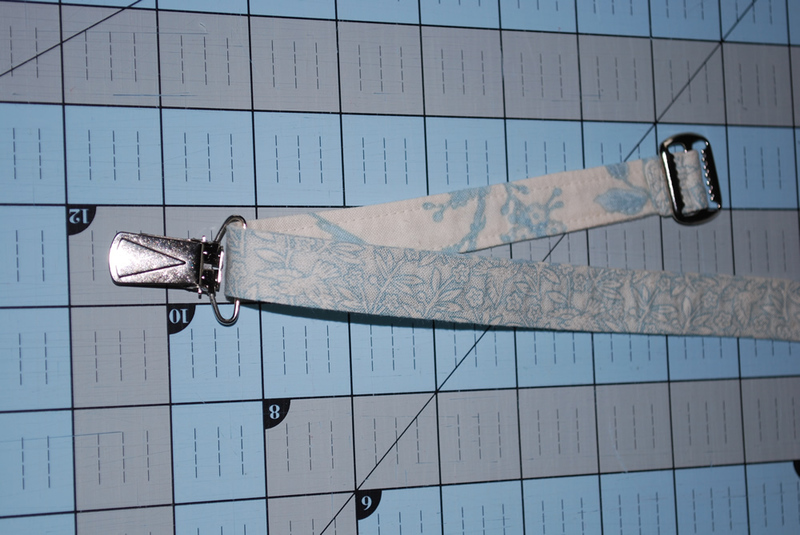 Take the two strips you want for the back side of the strap and iron the wrong side of the fabric to the fusible side of the interfacing. 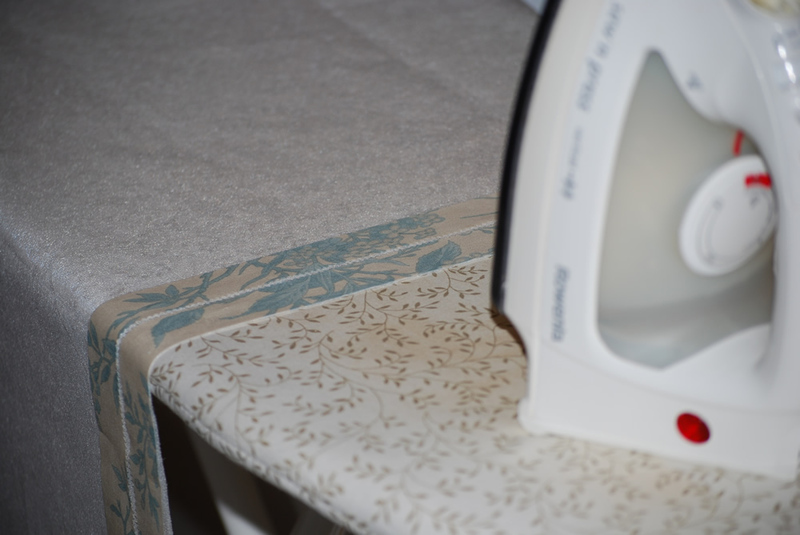 I like to iron the strips onto the full piece of interfacing first then cut around the strip once ironed on. 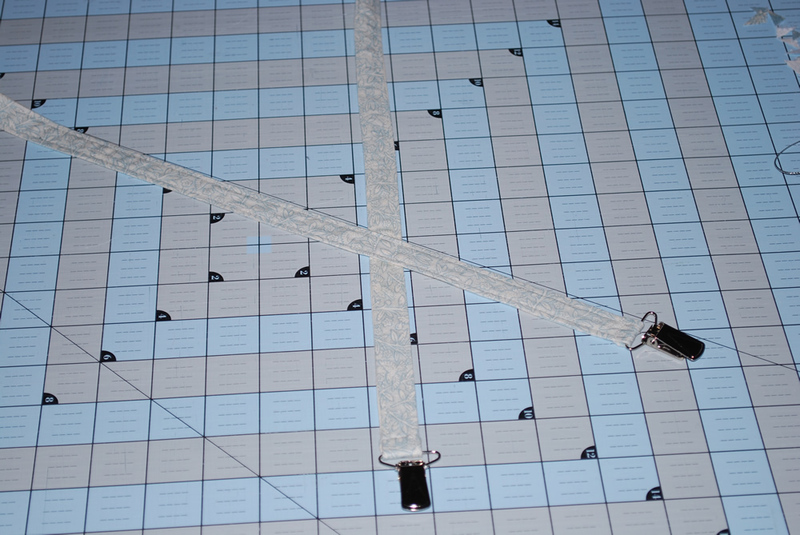 This saves you from trying to make sure that the interfacing is lined up properly with the strip. Place your front and back of the strap RST (right sides together) for both straps. 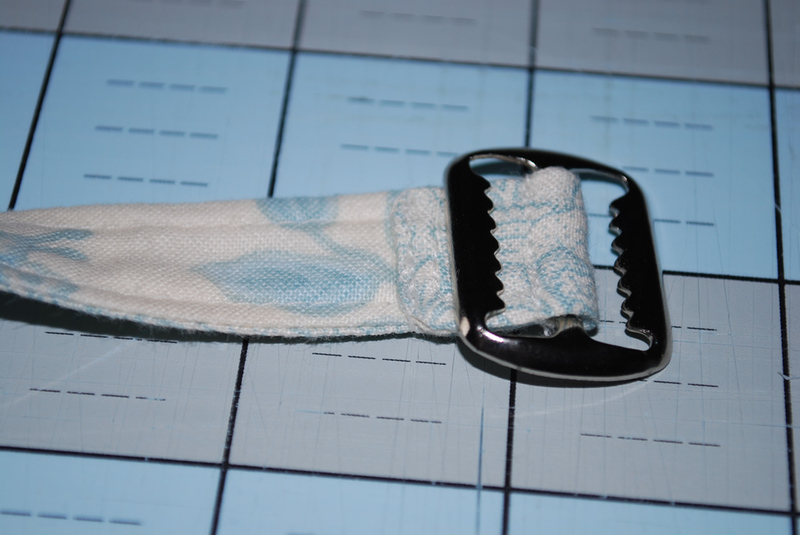 Sew with 1/4″ seam allowance all around the strap leaving a 3″ opening to turn the strap right side out. clip the four corners of both straps for nice clean points. Using your favorite turning tool, turn the straps right side out. I like the Crystal Point Turner by Lee. Fits perfect in small openings like this and makes a nice clean point without punching through the fabric. Please be patient with this step. 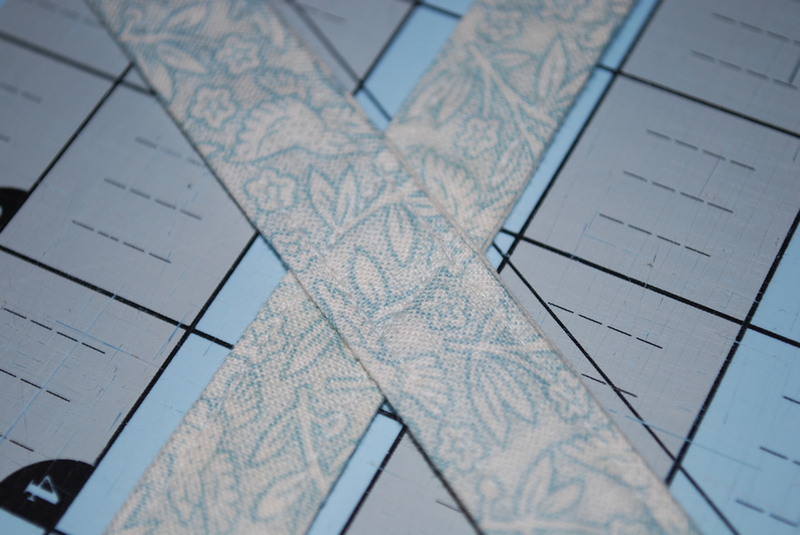 The straps are about 3/4″ wide now and turning may take a little time. Once you have turned both straps right side out, iron the straps flat lining up the opening so you can stitch the opening closed. 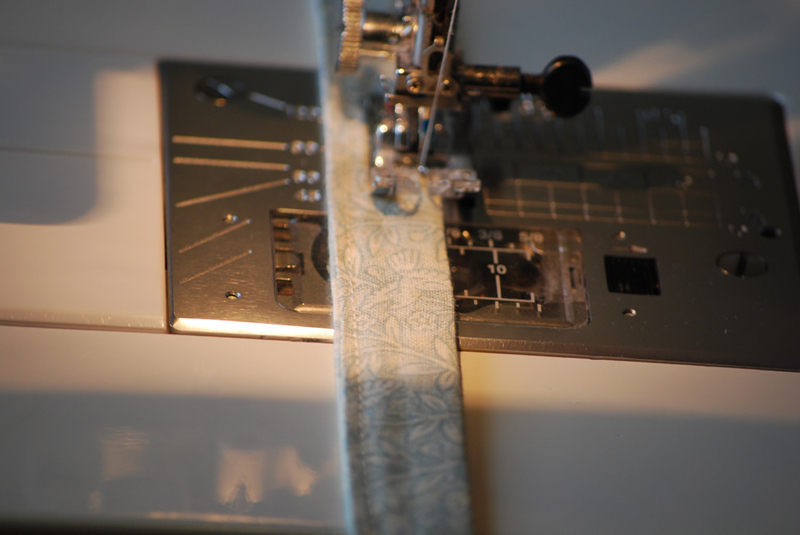 Sew a 1/8″ seam around the entire strap. This will also close the 3″ opening plus gives the straps a uniform look. 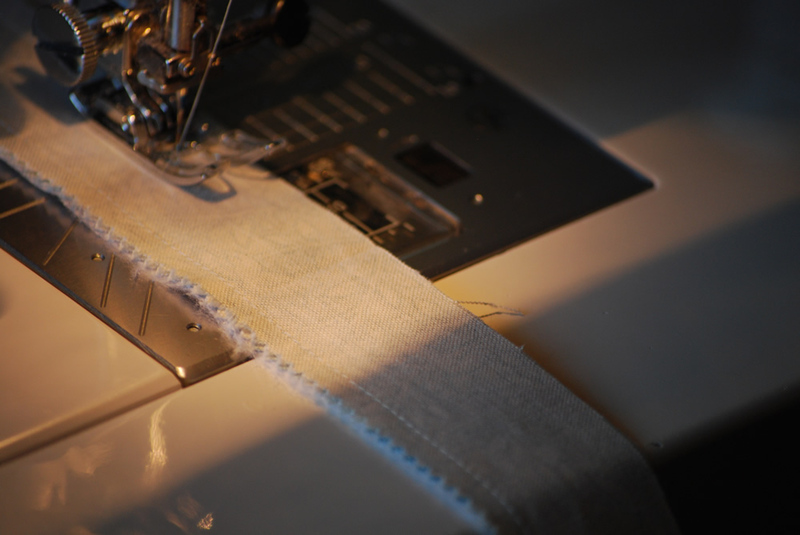 TIP: I like to make my stitch width a little bit wider to help keep the look of a nice straight stitch. With the right side (side you want showing when wearing) of the strap facing up, weave the strap through one of the vest buckles as shown. Wrapping the strap back around the middle of the buckle, pinch the strap together about 1/2″ from the center of the buckle. 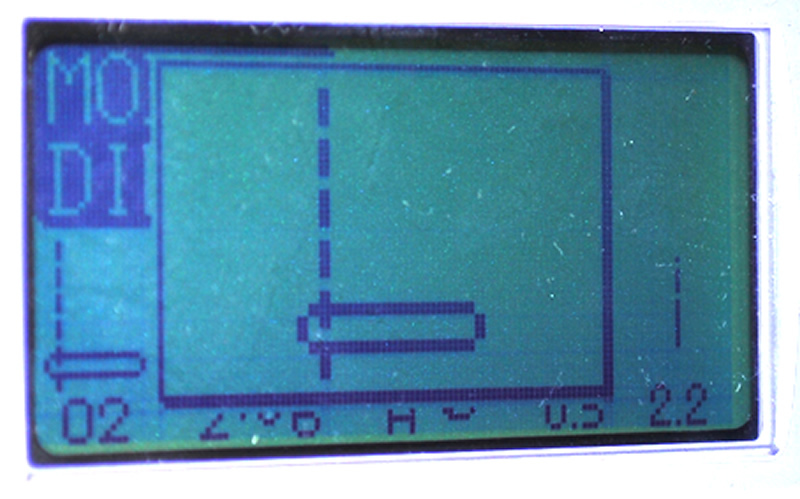 Set your sewing machine needle to the left. 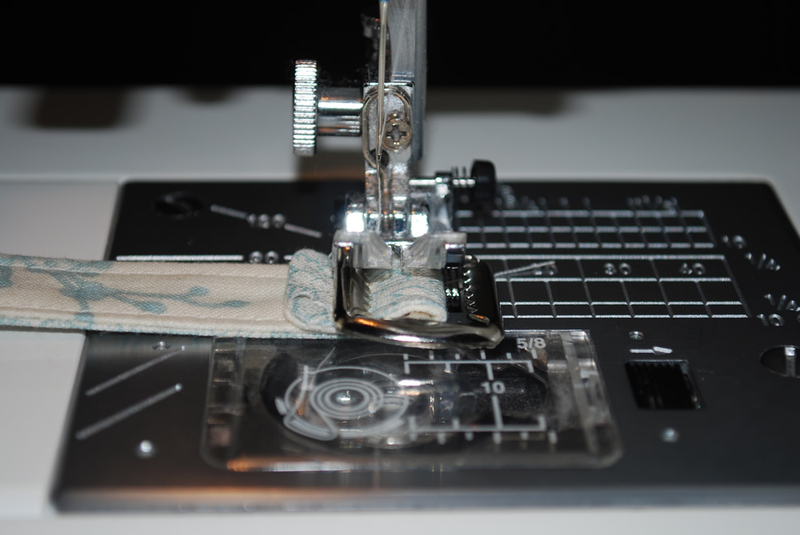 Place the buckle under the sewing machine foot as shown. 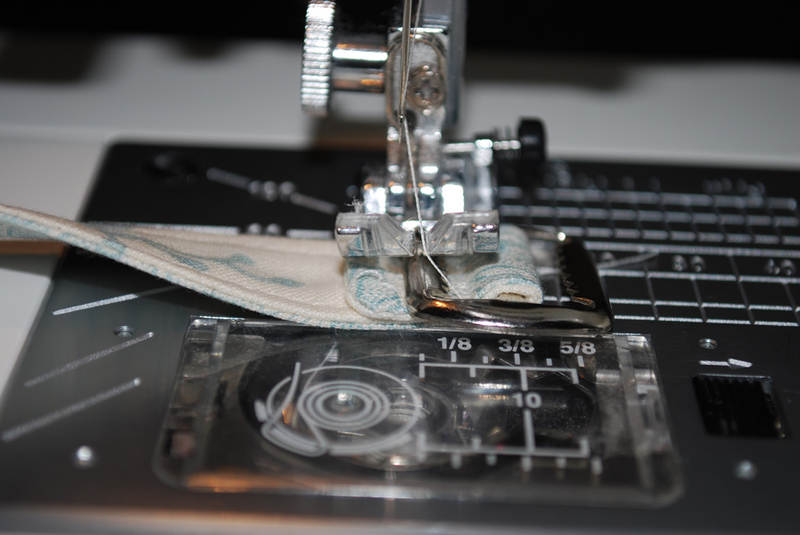 Making sure that when sewing, the needle comes between the center of the buckle and the left side of the buckle. Stitch slowly and back stitch a couple times to reinforce the stitch. You may need to start it off by manually turning the needle up and down to be sure you are not going to hit the buckle with the needle. 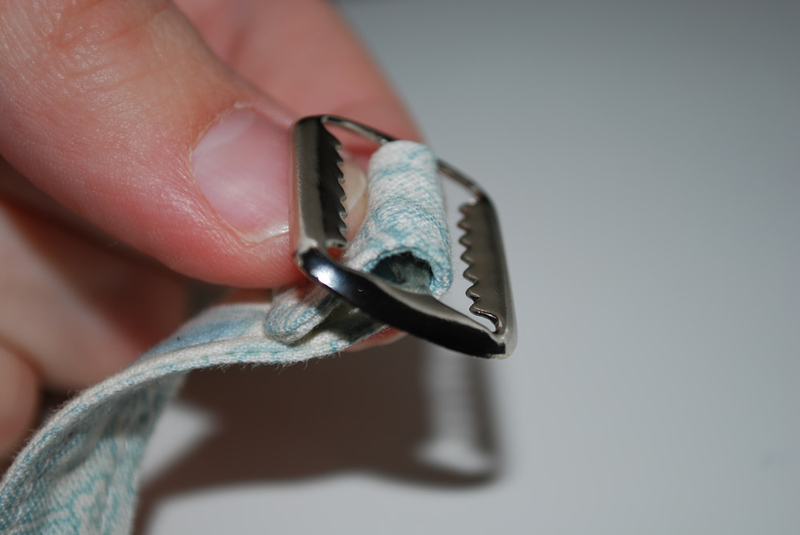 Move the buckle so that now you will be sewing the end of the strap down in the same manner as mentioned above. 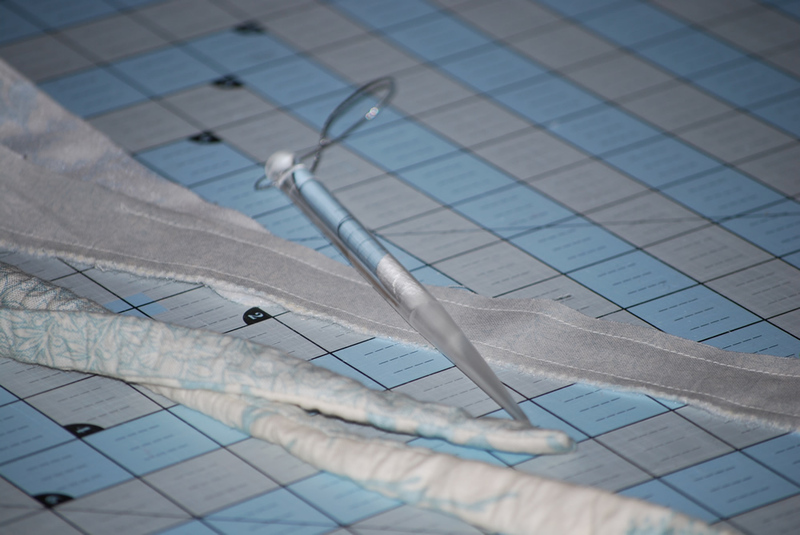 Keeping the needle position to the left, stitch to the left side of the buckle. 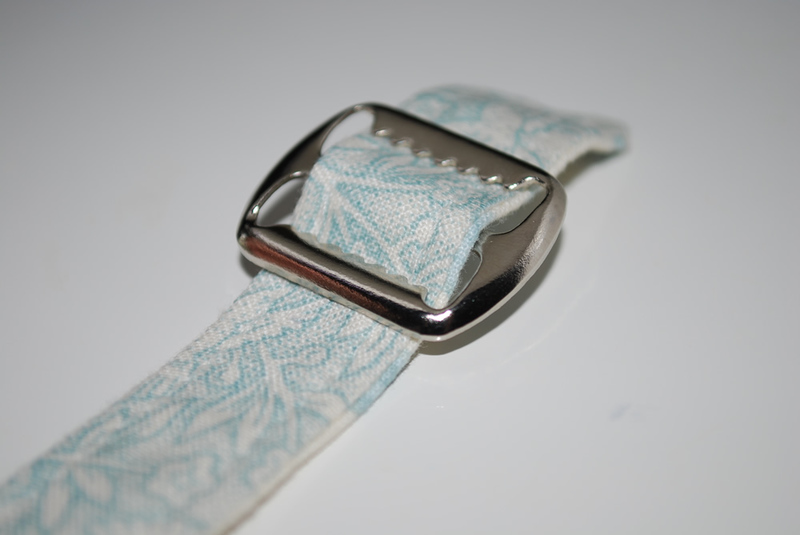 You should now have your strap sewn in two places to hold the buckle in. 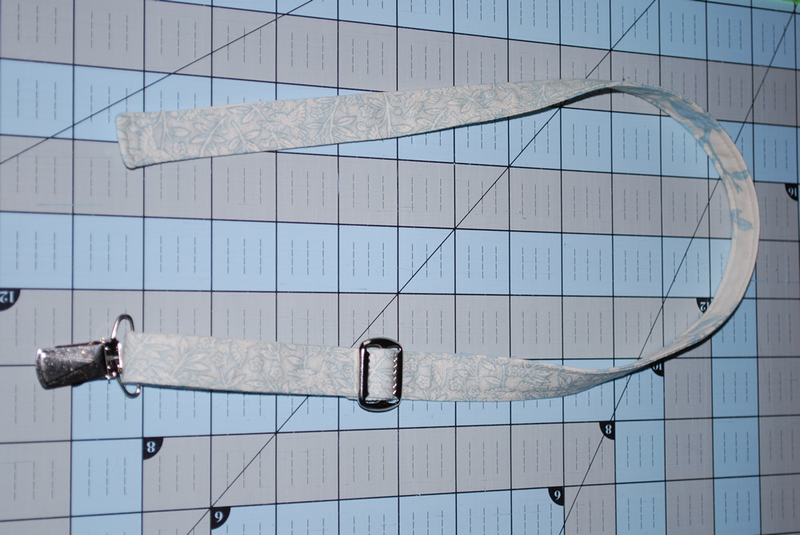 With the wrong side facing up, take the end of the strap without the buckle and weave it through one of the suspender clips. Be sure that the suspender clip is facing up like shown. Weave the end of the strap through the buckle as shown. Your strap should now look like this. Taking another suspender clip, weave the empty end of the strap through the clip with the right sides facing up about 1/2″. 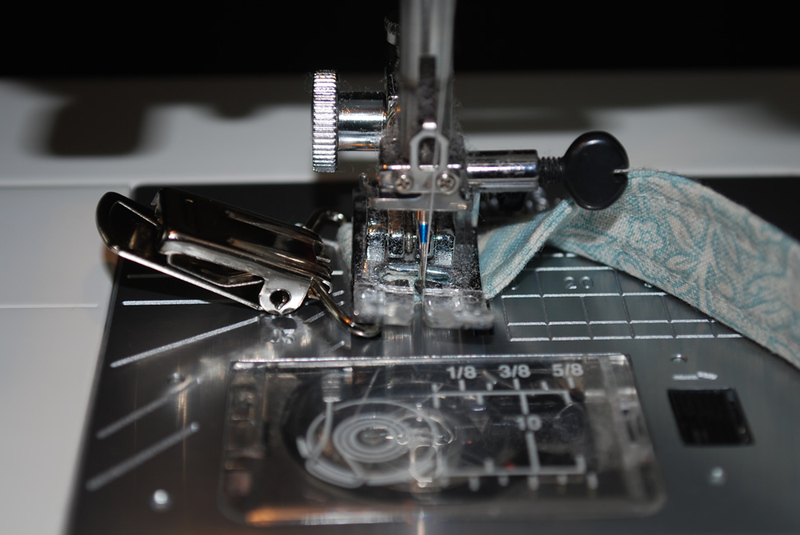 Set your sewing machine needle to the regular position, centered. 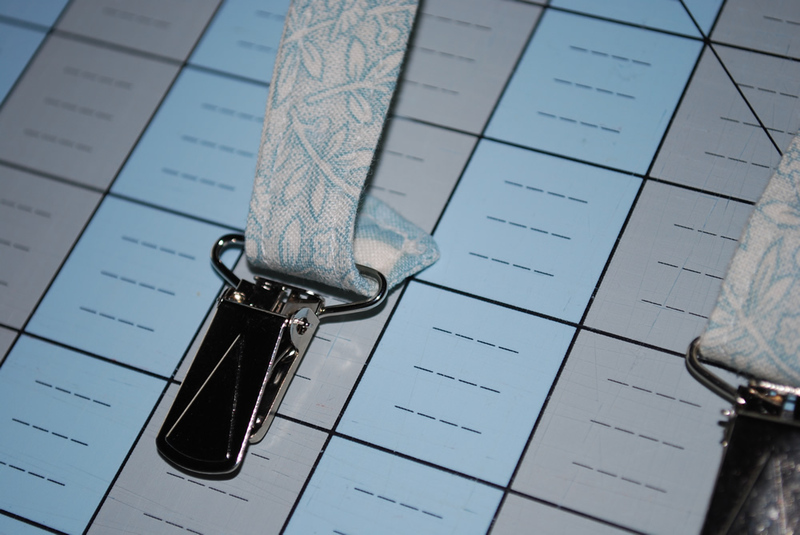 Stitch across the end of the strap. 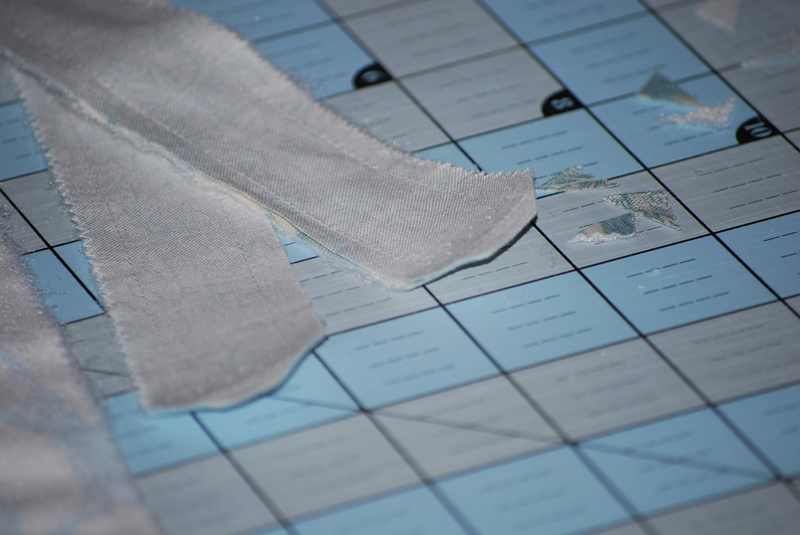 Backstitch a few times for reinforcement. You now have one complete strap. Repeat steps Eight through Twelve for the other strap. Place the straps on your child to determine where the straps will cross on the center of their back. 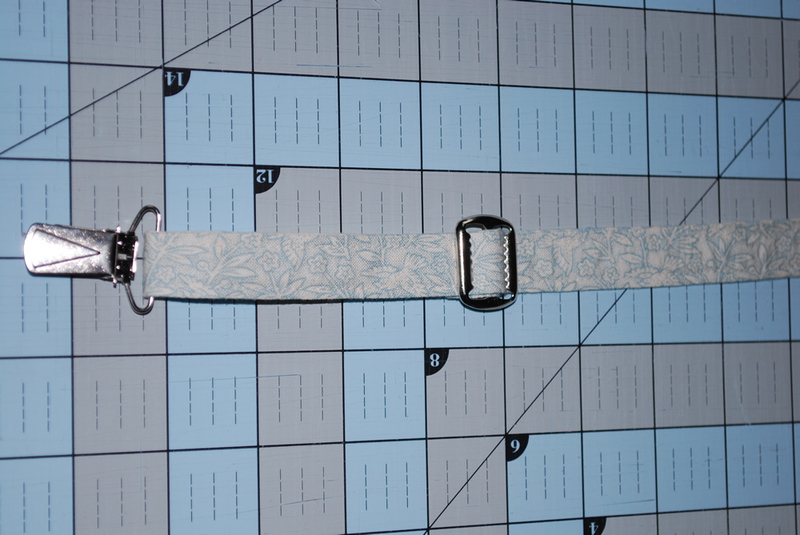 I did about 5″ from the end of the fabric without the buckle to the center of where the two straps meet. See below. 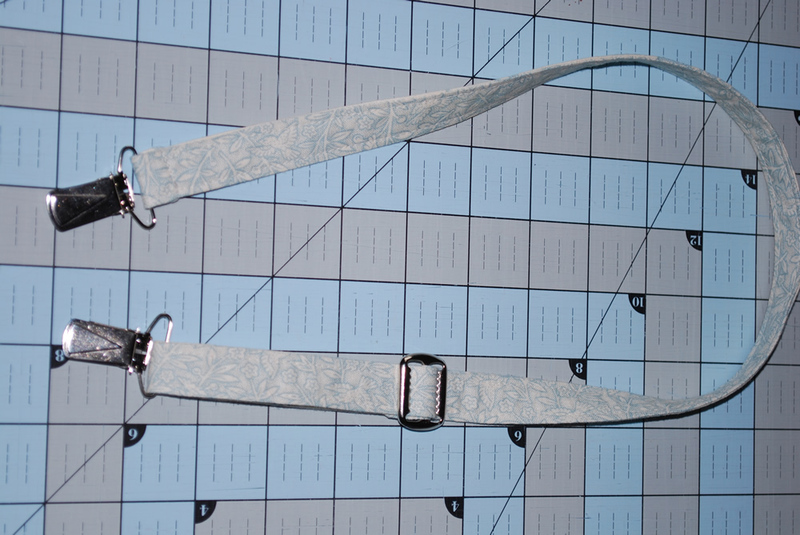 Place your two completed straps at a 60 degree angle. Sew a diamond shape where the two straps cross to hold in place. 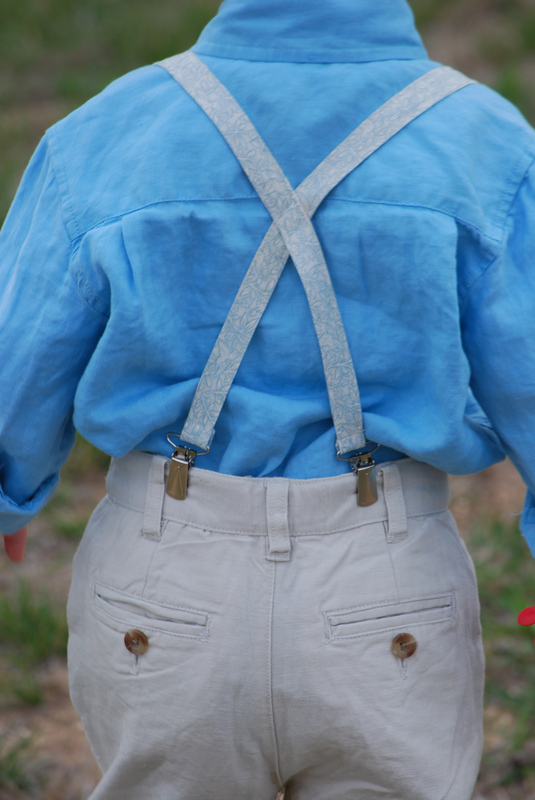 Pair up the suspenders with some linen trousers, shirt and newsboy hat for a very timeless look. 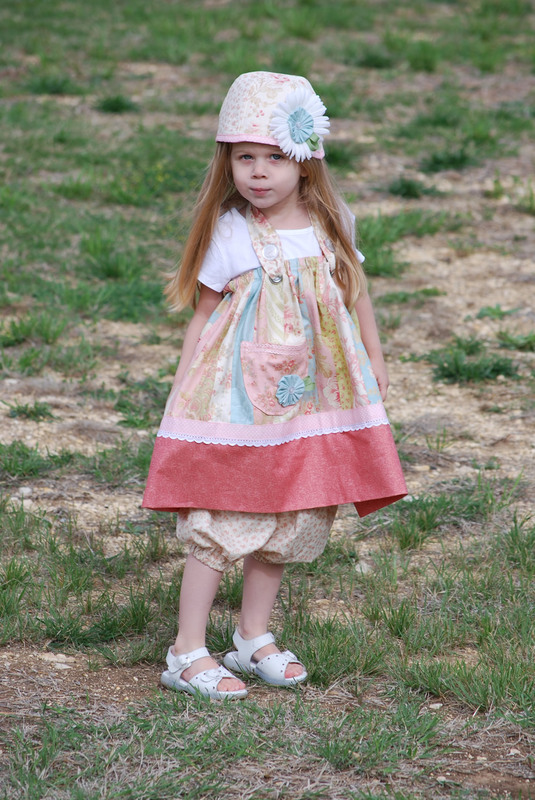 The linen clothing, hat and saddle shoes are from The Children’s Place. 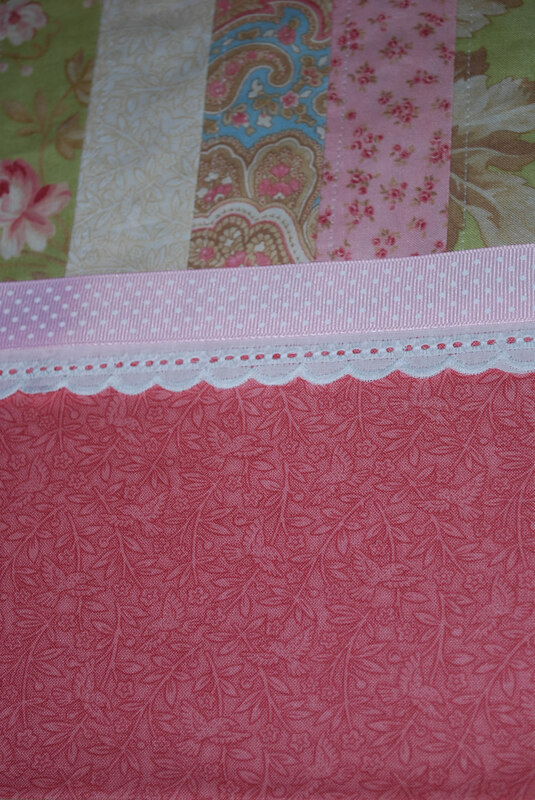 Following the directions on the pattern, select and cut the number of Jelly Roll strips needed for the size you wish to make. 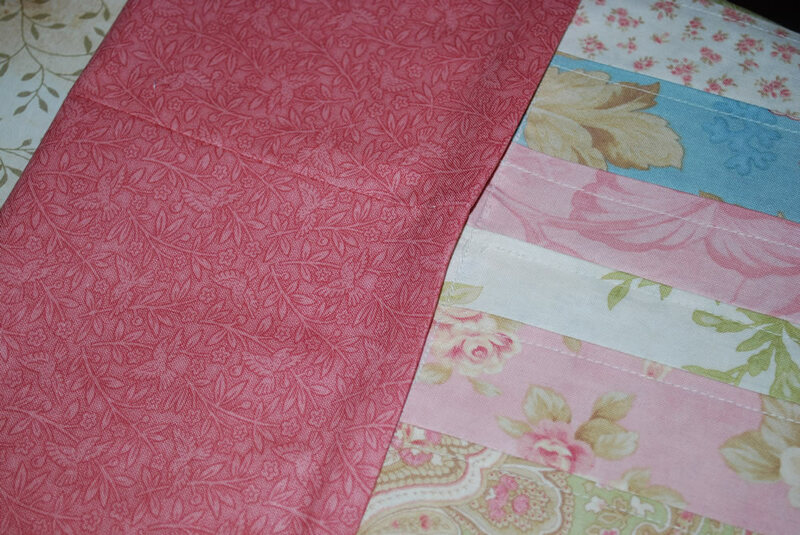 Sew all the strips together side by side making a large rectangle. 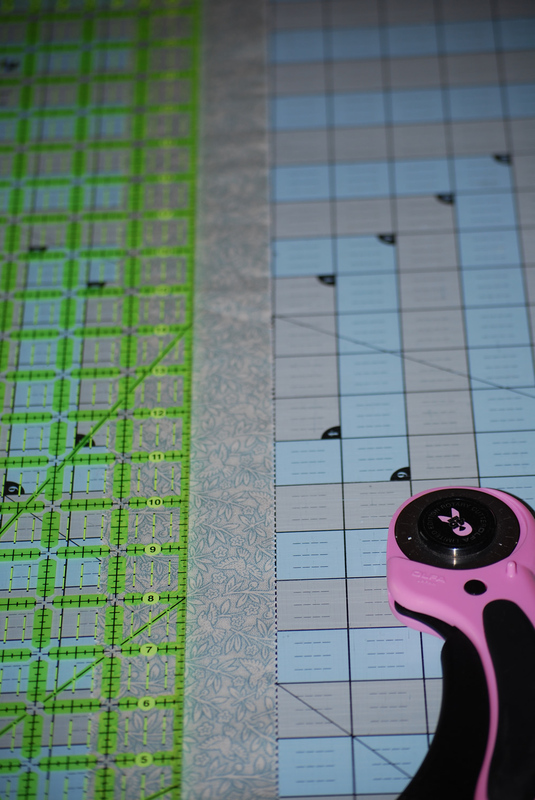 I like to separate my strips by color then sew the strips in color order, such as pink, white, blue, green, then repeat until all the strips are all sewn together. Iron the seams down to one side going in all one direction. Topstitch the seam in place 1/8″ from the seam. 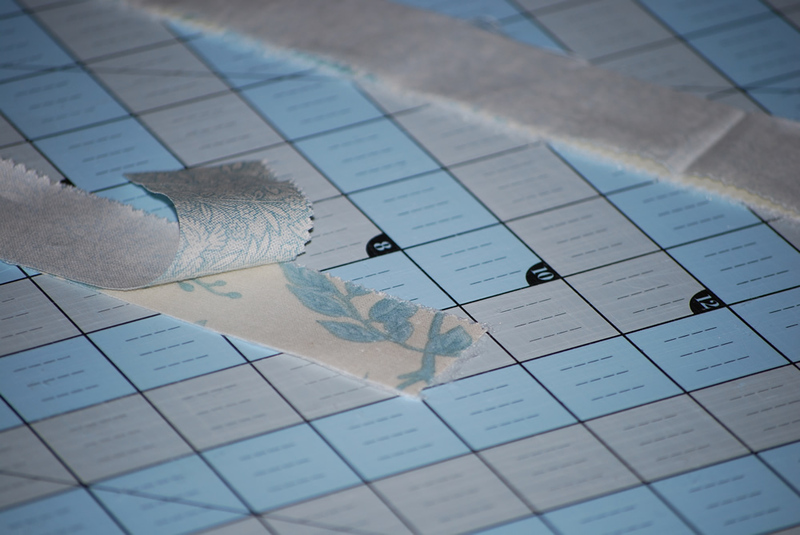 Measure and cut the trim piece as stated in the pattern and attach the trim to the strips. 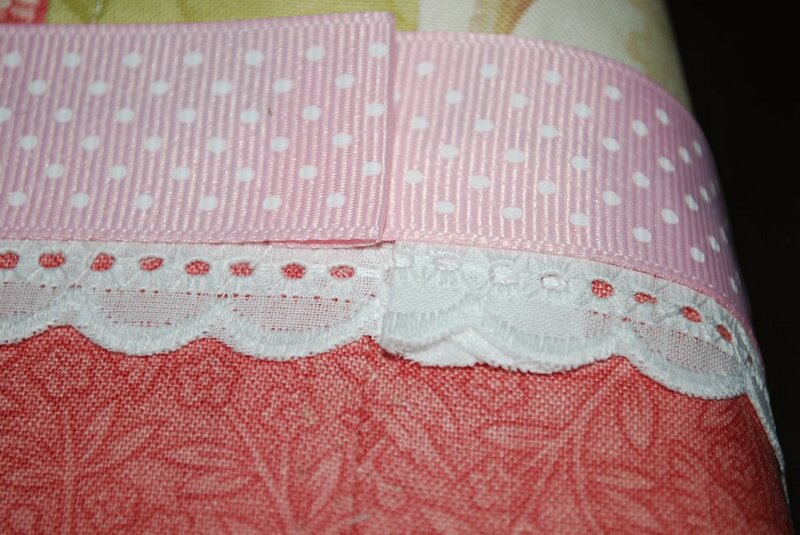 Layout the ribbon and scallop trim and determine their position. 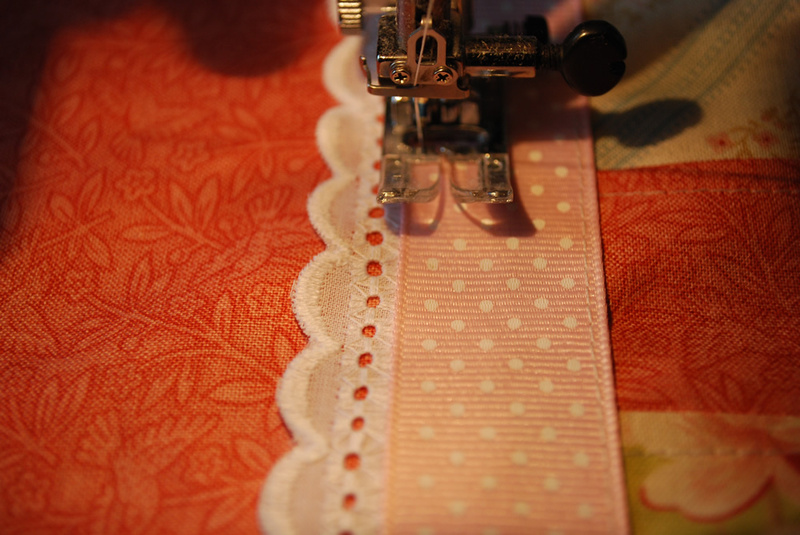 Apply the fusible tape to the back side of the scallop trim just above the detail. 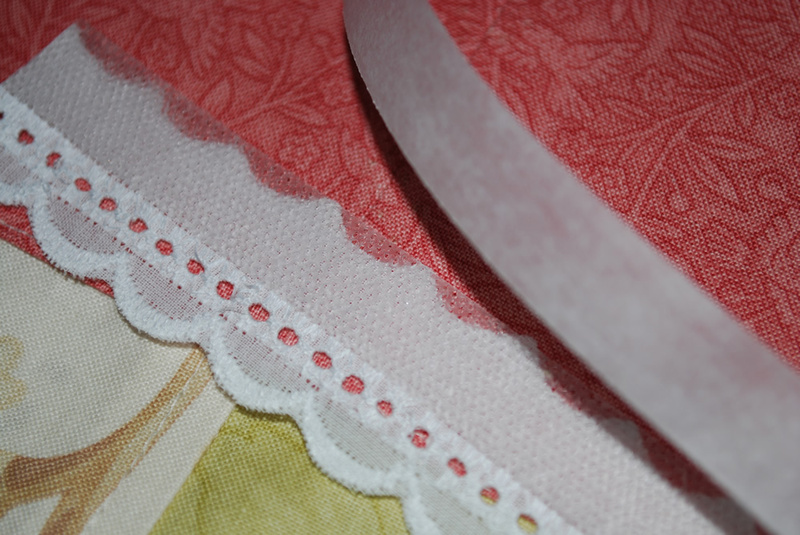 Position the scallop trim with the fusible tape right along the seam of the trim. Fold over the end to conceal the raw edge. Iron in place to fuse the trim to the trim. Repeat these steps with the ribbon and place the ribbon just above the scallop trim to conceal the raw edge of the scallop trim. Iron in place. 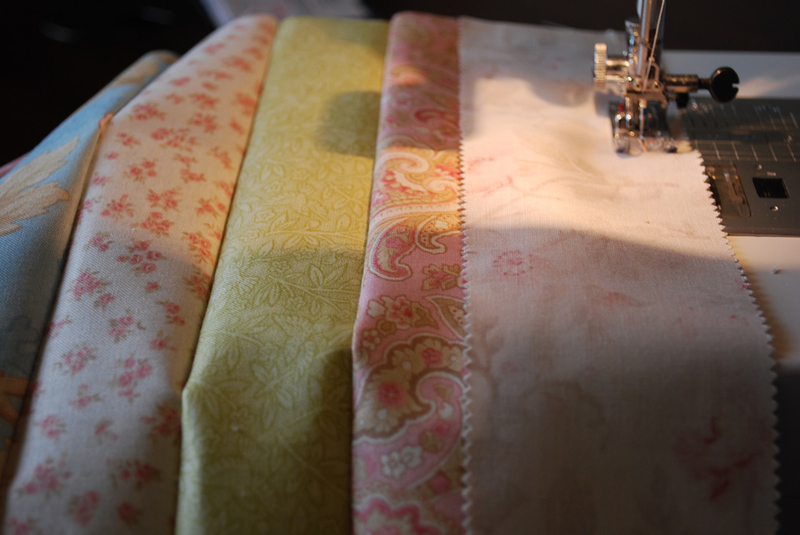 Sew a 1/8″ seam along either side of the ribbon. 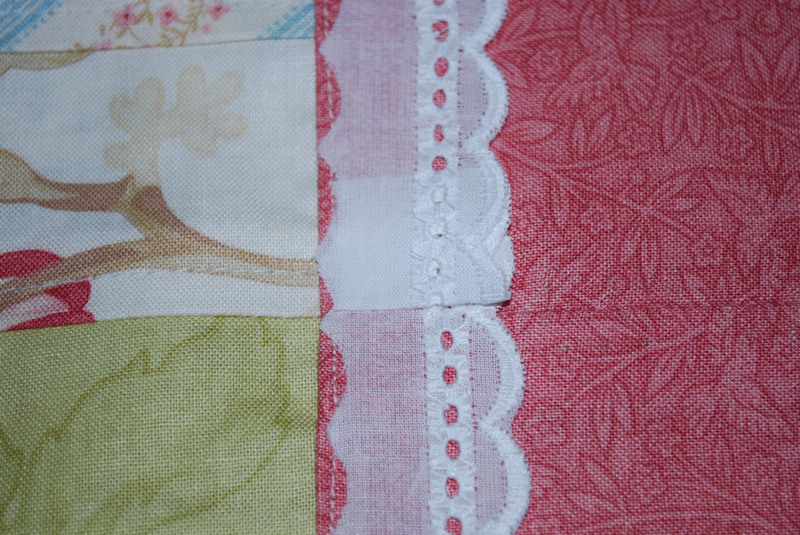 I use a wider stitch width to give it a straighter stitch appearance. Cut out the pocket using the template provided in the pattern. 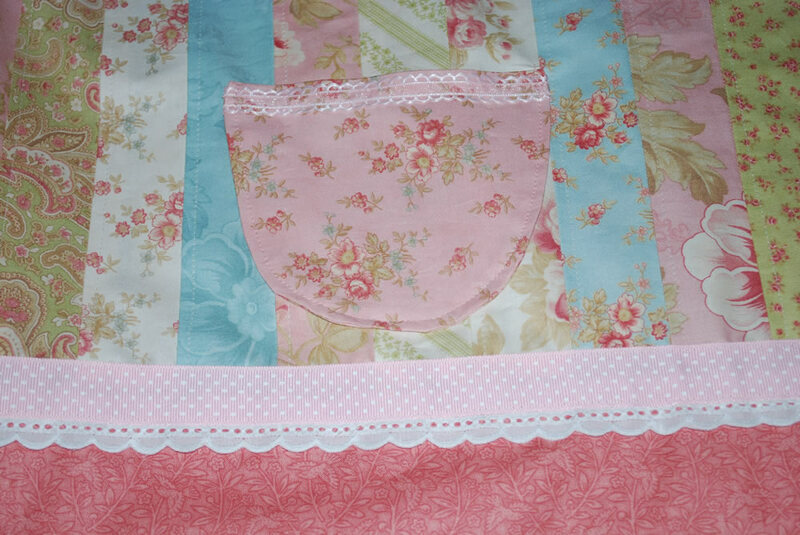 Add your 5/8″ ribbon detail to the top of the pocket and stitch in the appropriate place on the dress. 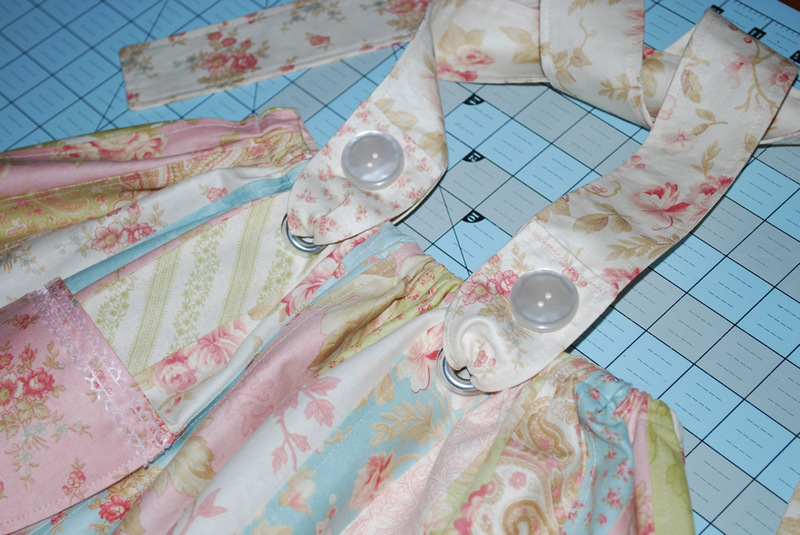 Create your straps, add grommets and attach the straps to the dress. Add any applique’, yo-yo’s, or other embellishments you desire to the dress. 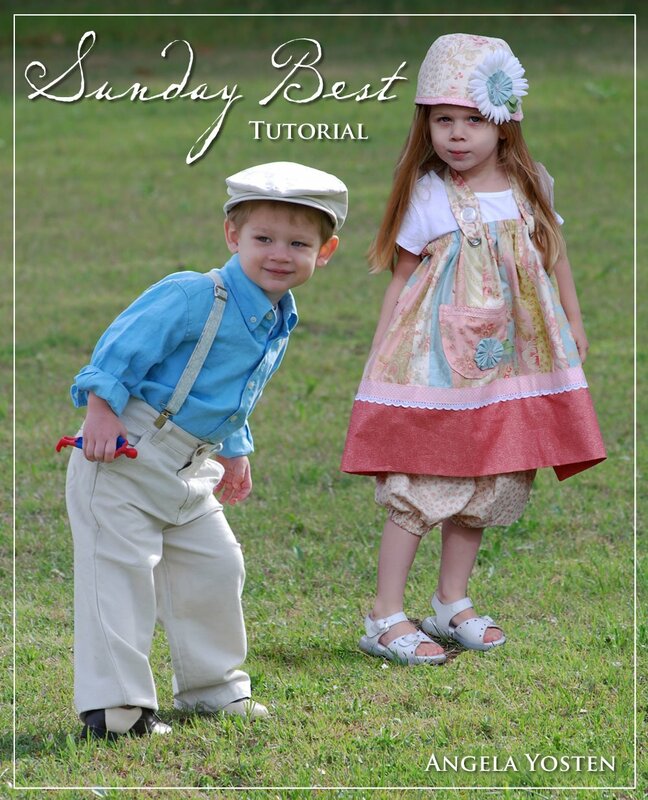 Instructions for a matching hat and short bloomers are also included in the pattern to complete the look of your Sunday dress. Dress is complete! 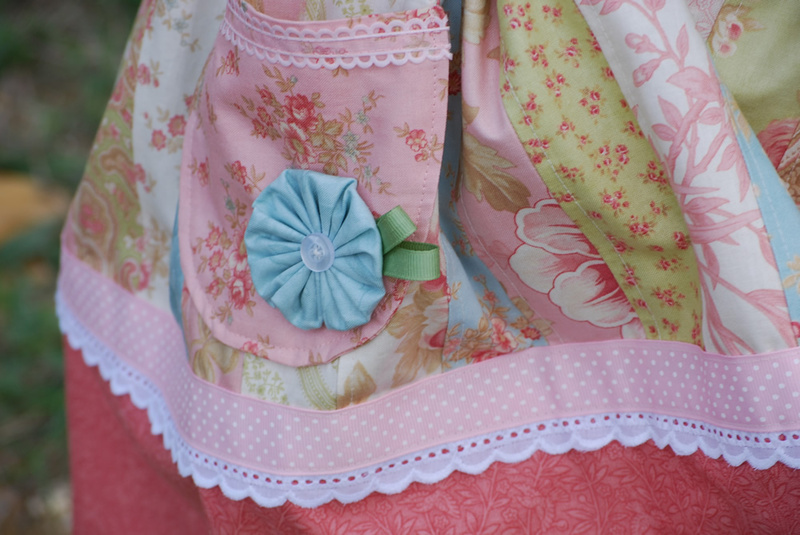 Now you have one adorable Easter dress or any other occasion dress you wish to make. Great for any season, simply add a long sleeve shirt and replace the bloomers with tights for colder seasons. ADORABLE! Thank you Jess for designing this adorable dress! 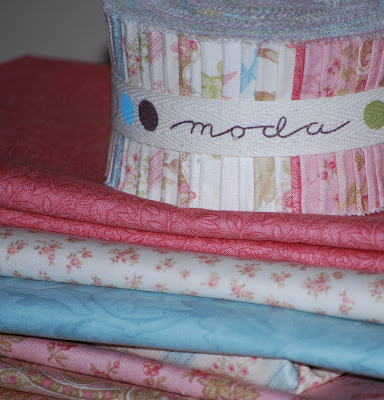 This entry was posted in Apparel, Baby and Kids, Jelly Roll, Moderate and tagged 3 Sisters, Aviary. Olá amiga,boa tarde.Estou encantada com os seus belíssimos trabalhos.O seu pap está formidável.Te adicionei no meu blogool,assim fica mais facil para eu poder te visitar.bjtos.Nile. WOW. i mean it. WOW! So cute…those suspender straps are the best! And the dress is absolutely darling! 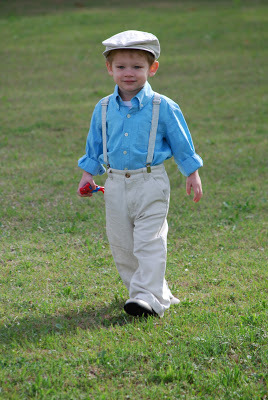 I would have never thought to use a jelly roll strip for the suspenders..this is a great tutorial!